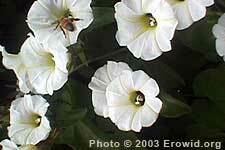 Turbina corymbosa is a large, woody vine with narrow, heart shaped leaves and white, bell-shaped flowers. The plant has been identified as the Aztec visionary intoxicant oliliuhqui. Oliliuhqui's round seeds contain LSA and they have a long history of use in Central Mexico.